Some would just as soon have us return to Plato's Cave. 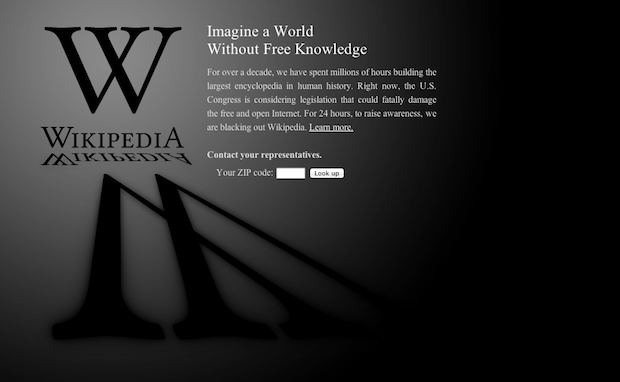 Prominent destinations on the Internet–including Google, Wikipedia, and Craigslist–went varying shades of “dark” Wednesday in a loosely coordinated effort to raise awareness of two bills currently making their way through the United States’ notorious “Do-Nothing Congress.” SOPA (Stop Online Piracy Act) and PIPA (Protect Intellectual Property Act) are bills being considered in the House of Representatives and Senate (respectively) to address the contagion of copyright infringement apparently fostered by a free and open Internet. However, as Julian Sanchez of the Cato Institute points out in a somewhat exhaustive analysis, the “problem” of copyright infringement seems hardly the kind of thing to rouse somnambulant legislators from a general stupor. Part of the problem here, as Glenn Greenwald makes evisceratingly clear, is that people like former senator Christopher Dodd–who vowed when he retired from the business of legislating in 2010 to eschew the filthy lucre of the so-called “revolving door” between congress and the world of high-stakes lobbyists–has been elbowing his old pals in Washington in his new role as Chairman and CEO of the Motion Picture Association of America (MPAA), one of the loudest voices moaning about lost profits and stifled creativity supposedly attributable to Internet piracy. as frightening as it may be, shows we could be at the precipice of changes that might begin to bring things back into balance.